It’s hard to remain unbiased when you’re responsible for hosting the largest summit and celebration for professional black women. So, we’ll just go right ahead and say it. The first day of the 14th Annual Women of Power Summit hosted by ADP was incredible. 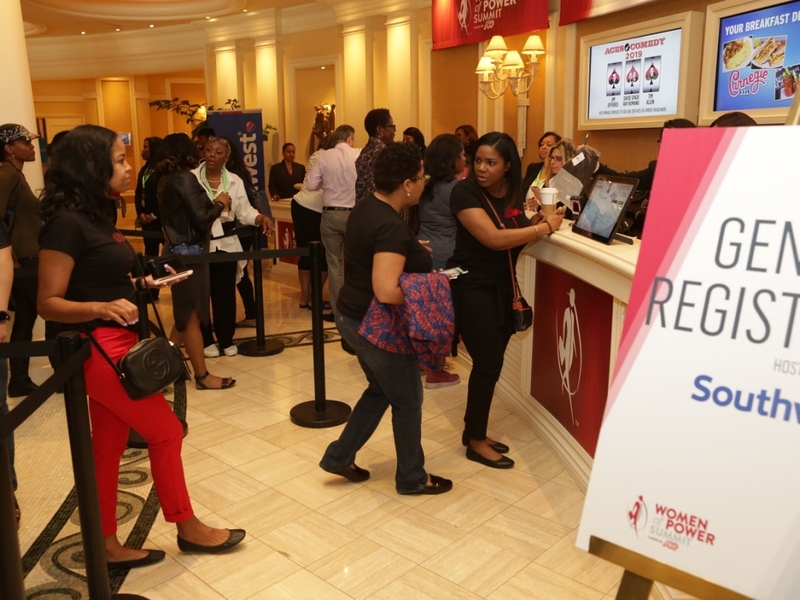 From the moment women stepped foot into The Mirage they were greeted warmly by members of the staff and volunteers during registration hosted by Southwest Airlines. Women immediately began to network and reconnect with old friends after receiving their swag bags. Shortly after, women gathered at the Fashion Show Mall for the ultimate girls trip to Macy’s for the shopping excursion. Picture heading to Macy’s with hundreds of your girlfriends, new and old, and shopping until you dropped. Now add exclusive deals, free manicures, hair styling, and teaming up with personal stylists to jazz up your closet. That’s exactly the experience women had thanks to Macy’s. After hours of girl’s time on the strip, women reconvened at The Mirage for the Legacy Awards Reception hosted by Toyota. Monica W. Peterson, director of affiliate vehicle planning and pricing product planning & strategy for Toyota Motor North America, welcomed women to the reception and challenged women to get out of their comfort zones during the summit and level up! Earl “Butch” Graves Jr, president and CEO of Black Enterprise, also encouraged women to rejuvenate their purpose. And may we say that the women looked stunning and showed out. Which was to be expected in anticipation of the 14th Annual Legacy Awards Gala hosted by PepsiCo. After all, who wouldn’t want to get fancy for an evening with Chaka Khan; Cynthia Marshall, CEO of the Dallas Mavericks; Vashti Murphy McKenzie, the presiding prelate of the 10th District AME Church; and Pulitzer Prize-winning author, Alice Walker? The awards gala was hosted by our beloved Caroline Clarke, the chief brand officer of Women of Power at Black Enterprise. During her welcome, she reminded women that they are royalty. “Keep calm and carry your head high—and always remember there’s a crown on it.” And in true Caroline Clarke-style, she led women to empower one another with affirmations and hugs. “Get up, hug someone, and say ‘I see you. I got you!” said Clarke. During the evening, Debbie Dyson, president of national account services for ADP; Phyllis A. James, chief diversity and corporate responsibility officer at MGM Resorts International; and Merary Simeon, vice president of diversity & engagement, North America for PepsiCo, greeted attendees and gave inspiring remarks. Alice Walker received the second honor for her literary genius and contributions to society as a change agent. She spoke passionately about black Americans’ journey in the states. “If we love ourselves and deeply feel that love and deeply live that love, we cannot be defeated,” she boldly exclaimed. The evening was nothing short of phenomenal and we are looking forward to the second day of the summit tomorrow! If you weren’t able to make it to Vegas, tune into the Women of Power Summit Livestream to get your digital front row seat! Be sure to follow the event online with the hashtag #BEWPS. The post The Official Women of Power Summit 2019 Recap [Day 1] appeared first on Black Enterprise.